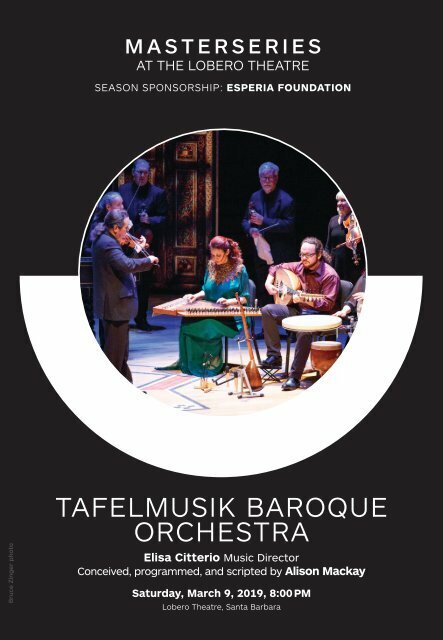 SATURDAY, MARCH 9, 2019, 8:00 PM TAFELMUSIK BAROQUE ORCHESTRA ELISA CITTERIO, Music Director with ALON NASHMAN, narrator and TRIO ARABICA Tales of Two Cities: The Leipzig-Damascus Coffee House Conceived, programmed, and scripted by Alison Mackay Directed by Elisa Citterio Alon Nashman, narrator TRIO ARABICA Maryem Tollar, voice & qanun Naghmeh Farahmand, percussion Demetri Petsalakis, oud Marshall Pynkoski, Stage Director Glenn Davidson, Production Designer Raha Javanfar, Projections Designer It’s 1740, and coffee houses are the places to listen to music and share stories, in both the famous trading center of Leipzig and one of the oldest cities in the world, Damascus. The latest Tafelmusik Baroque Orchestra multi-media musical offering Tales of Two Cities: The Leipzig-Damascus Coffee House illuminates each city’s striking features in common: both enjoyed a lively tradition of coffee houses in which the finest musicians of the city performed and both were also famous centers of scholarship and learning. Anyone who has attended one of Tafelmusik’s three previous multi-media concert projects at the Lobero in the past decade (The Galileo Project, House of Dreams or J.S Bach: The Circle of Creation) can attest to the incredible originality and conception of their insightful musical stage creations that combine live music, text and stunning projections transporting the audience back in time and place. Not to be missed!